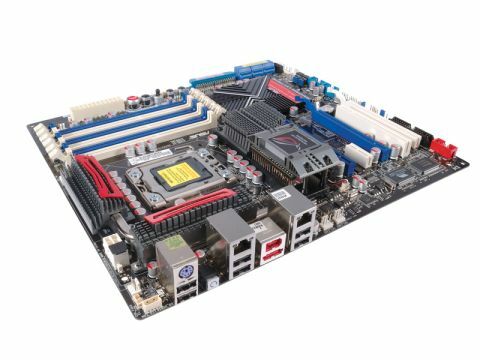 Are this X58 board's features a geek too far? It's a board that sits at the very top-end of the market, but do you really need those features? Designed purely and simply as a gaming board, the Asus Rampage II Extreme falls under the Republic of Gamers branding, the ethos of which is to bring the best engineering, fastest performance and innovation to gaming enthusiasts. With this in mind, the board uses Japanese Multilayer Polymer Capacitors for the ultimate in performance and stability, so that you can take overclocking to the extreme, without worrying about over-stressing the board components. TweakIt is a rather nifty overclocking tool designed for those who want to control every aspect of their board, down to the smallest level. It works in tandem with a USB LCD display, called the LCD Poster, which can be used to display every last piece of boot information imaginable. On the board itself is an array of switches and buttons, including a joystick control. Once you've connected the LCD Poster display, and booted the board, you press the 'Conﬁrm' button to enter the TweakIt process. From here you can adjust voltages for eight different areas, including the CPU and RAM, adjust fan speeds, display temperature readouts, and even choose which of the two BIOSes to boot from. The Twin BIOSes mean you can use a known BIOS for everyday use, and a performance BIOS for overclocking, for example. You can also copy one BIOS to another, which makes upgrading the BIOS a doddle. placement of multimeter probes. Should you be reluctant to start probing your board directly, then each probe point has a socket, into which an insulated adaptor can be plugged, and which slides onto the probe tips. This also means you don't have to hold the probes in place, while you tweak the settings. Most, if not all of this data is available through the BIOS and Windows software, so quite why you need to conﬁrm it for yourself is beyond us. Along with the TweakIt buttons, illuminated start and reset switches, and a variety of status LEDs to show if your CPU, RAM and chipset are running normally or in 'crazy' mode, it would seem that Asus anticipates you'll spend a lot of the time with the side of your PC case removed. However, the buttons are small and a little ﬁddly to use. Once ensconced in a PC case, with the usual multitude of power and SATA cables, the chance of you being able to use the buttons, or see the LEDs are slim. There are numerous ways in which you can overclock the CPU and memory in the BIOS with four different methods, just for the CPU. Depending on the CPU, you have different overclocking options for the memory, as well. For a standard, non-extreme CPU (ie. a clock-locked one), standard memory speeds you can choose are 800 and 1,066. Two further overclocked speeds of 1,333 and 1,600 are available through the Memory Up option. If you have extremely deep pockets and can therefore afford an Extreme Edition CPU, then you have far more options. Standard speeds available are 800, 1,066, 1,333, 1,600, 1,866 and 2,133, while the Memory Up mode enables you to use 1,600, 1,800 and 2,000. Some overclocking can also be done in the OS, using the TweakIt software. However, if you've done any overclocking in the BIOS, this is automatically disabled to safeguard your system. The EPU 6-engine software enables you to set proﬁles for your system, ranging from Turbo to max power saving. A readout even tells you how many milligrams of CO2 you've saved by switching modes, which is novel, if not that useful. Set the system to Turbo mode, however, and you can crank the CPU speed up, until you hit stability issues. As you'd expect, both SLI and CrossFire are supported, and there are three slots for graphics cards. There's no shortage of ports, with six SATA II sockets, an eSata port, two FireWire ports and the obligatory IDE port. The back panel has six USB ports, with headers for six more on the board. Audio isn't integrated, but comes on a card that uses a dedicated PCI slot. Because this is an X58 board, there are six DIMM slots for installing three matched modules, in a triple-channel conﬁguration. In performance terms, the Asus Rampage II Extreme destroys the P45. Our test with Corsair's triple-channel kit achieved an outstanding 27Gb/s throughput, with memory read speeds clocking in at 16Gb/s, which is over twice the ﬁgure supported by P45. This might be the ﬁrst of a new breed, but its price is enough to make you feel faint. There's no arguing with the performance ﬁgures, but we can't help feeling that there are too many frivolous features being used to justify the price tag.